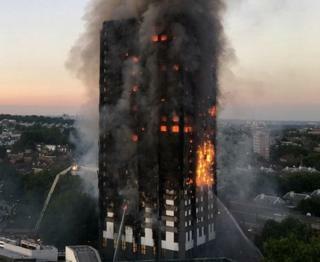 London tower fire: Why were taller fire platforms not used? London Fire Brigade (LFB) have announced the service is looking into buying taller aerial platforms in the wake of the Grenfell Tower fire. Appliances currently owned by the brigade can only ascend up to 32m (105ft) and could not reach the upper floors of the block. Commissioner Dany Cotton told the BBC it was "one of my priorities" to get taller fire trucks and "early conversations" had already been held. But given how many tower blocks there are in the capital, how come the city's brigade do not already have access to such appliances? "There's lots of anger in the fire services", Lucy Masoud, a firefighter and regional officer for the FBU explains. "Those firefighters on the scene who had to make a choice about who they were going to save and who they had to let stay and die." She believes taller aerial appliances would have been a "game changer". "They give more accessibility and more options, and are safer for us as firefighters... Undoubtedly we would have been able to save more lives," she said. The tallest aerial platform used in the operation at the north Kensington block was borrowed from Surrey Fire and Rescue Service. Reaching up to 42m (138ft) in height, the fire truck, which is based in Leatherhead, is the tallest in the country. Yet it was unable to reach the top floors of the 24-storey Grenfell Tower, which stands at nearly 70m (230ft). The issue of whether LFB should have taller platforms has been brought up before at the inquiry into the 2009 Lakanal House fire in Camberwell, south London, in which six people died. "We wanted to see a recommendation for platforms and ladders that could save people and also issue jets of water in high-rise tower blocks," victims' lawyer Louise Christian said. She said a written submission by fire experts to lawyers for the Lakanal House inquest specifically mentioned aerial platforms built by Bronto Skylift, but no recommendation was ever made. Bronto Skylift, based in Finland, develop aerial platforms which can reach heights of more than 100m (328ft). According to managing director Harry Clayhills, the firm's fire platforms are used by more than 100 brigades in 16 countries around the world. A 90m (295ft) appliance costs more than £1m each but can be used to rescue people from tower blocks and allow crews to spray water on a blaze from a height. But it is not known if such a unit would have been able to get close enough to the tower for it to be used given the intensity of the fire and the layout of the surrounding streets. It is London's road layout which partly explains why larger devices are not currently owned by London Fire Brigade. A spokesperson for the brigade said the appliances they use have been "selected for their manoeuvrability and ability to access properties". Higher ladders "require more room and carry more weight and so are often impractical in a city like London where streets and road ways can be narrow and traffic is often congested," the spokesperson said. They added that high-rise fires were also usually fought by crews from within the building itself "to ensure the seat of the fire is attacked as quickly as possible", rather than from a height. Ms Cotton said high platform vehicles were now available which could fit into London's narrow streets. "We are fortunately just about to replace our aerial fleet so as part of that we will look at the new technology that will allow us to have taller aerial platforms," she said. MP Jim Fitzpatrick, who was a firefighter in the capital for 20 years, believes the public inquiry into the Grenfell disaster will have to look at whether the brigade had the correct equipment for the job. "These are genuine and realistic questions that the inquiry will have to answer," he said.